Poll: What type of Machines should this mod add? Poll: Release early & Often... Or wait until its feature complete? We plan on updating often now as we'll be adding more and more features to the game. Update 11/26/17 Working on updated to 1.12.2 of minecraft and have BlueBoy17 Helping with the new models! I just wanted to start an official forum thread for anyone interested in following along or help with the textures/development of my mod. This is also a good place to make any suggestions just drop a reply. Note: With this being an early alpha build there may be bugs & Some features are still being worked on. Not responsible for any damage to your worlds. Have fun! Plow - till the ground in preparation for planting. Remember all farmland needs water! Planter - get those seeds into the farmland fast. Sprayer - Bone Meal it up and get those crops growing. Combine - Used to Harvest crops. Dump Truck - Drop items/ blocks into the bed of this truck and haul them off over long distances. Contains a double chest worth of inventory. Once your at your destination raise the bed and drop the items out or drive over some hoppers to have them pull items out of this dump truck. Either way its great for delivering ores to your processing station. Front End Loader - Intended to scoop up the Blasted Stone from and load it into the dump truck! 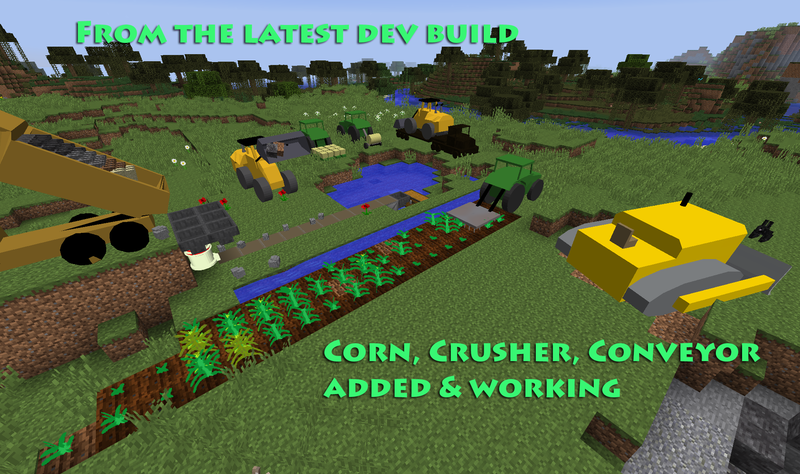 Bulldozer - Need to flatten the land for your farms or clear a forest quick then this is the machine for you! Sky Hook - Helicopter If i get really bored one day after doing everything else I may add a sky hook helicotper that can be used to pick up chest & such. No promises on this one yet. Airplane - its not really a Heavy Machine is it.yes the can be big but they wont have a real purpose. Sprint key [ Control by Default] - This will have the machine perform its "Down" function. Examples : Lower the loaders bucket, lowers the bed on the dump truck, Plow the ground in the tractor with the Plow attached etc..
Jump key [Space by Default] - This will have the machine perform its "Up" function. Examples : Raises the loaders bucket, raises the bed on the dump truck. Drilled Stone - Something must have put a hole in it. Explosive Packed Drilled Stone - Warning keep away from all redstone Torch flames. Blasted Stone - This can't happen in Minecraft... Can it? Crusher -Feed it your blasted stone & it will pulverize it down and double any ores it finds and turning them to dust. Conveyor - used to move items from point A to point B. Corn (item) /seeds - Plant corn in the ground and it will grow into a full plant that can be harvested. It can be eaten of course but it also can be used to create ethanol to fuel your machinery. Find your first corn among the weeds of the flat lands with little to no trees. Corn (block) / plant - Grown on farmland and harvestable when its a nice golden brown. This plant will supply you with all your corn needs. trenching machine or trenching attachment to the tractor - will create a 1 wide 1 deep hole in the ground that can be flooded to hydrate your farmland. Engine - used to power all your block based machines . Screens - Just like a real world stone quarry you can use shaker screens to separate out different materials and send them down different conveyor lines. Currently Looking for a texture artists. - I can code , I can even make basic 3D models but the fine art of making good textures eludes has eluded me on all levels. If you'd like to help drop a reply. For now I'll do my best on my own till I find an a better artists. Thanks & yeah I'm looking for help with textures and what I have so far are just placeholders. Major Rendering bug has been squashed ! Not sure why that would be needed. 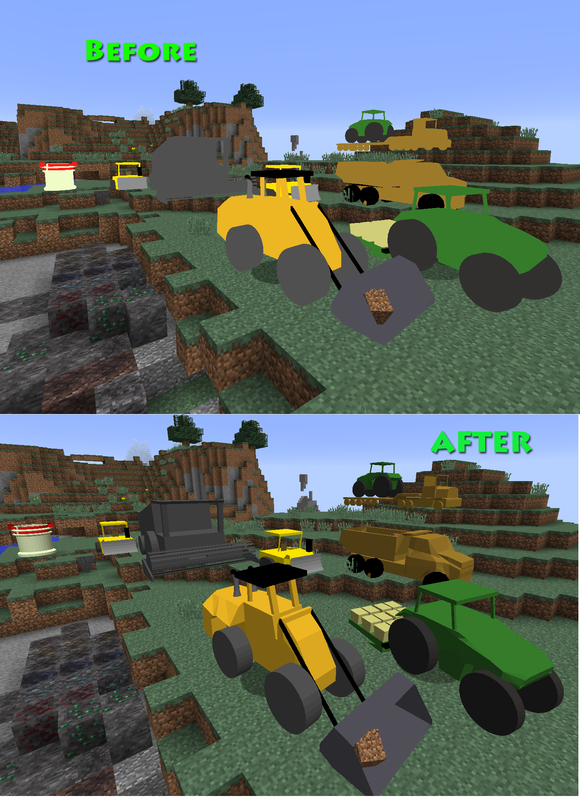 As it stands now you'll want to use the machines because they are much faster to break blocks than vanilla tools. if you want to flatten a lot of land & clear a forest the bulldozer is the tool for you because it can push over trees & break dirt , sand & gravel in a three wide area. Jump on a server with a few friends each in a machine and you can transform the landscape very quickly. Also they currently do not break down. I do however plan on adding a fuel requirement to allow them to run. I also have plans for a few machines I haven't put in the list on the main post yet and I keep hearing good ideas for additional machines. Most of them are around breaking blocks but I'd like to build something that can aid in building too. Hey guys I've added a poll to this post to get your feedback. Should this mod only add realistic machines or should it also add in some futuristic machines that I invent? Example: Laser based Mining machine. I thought about adding cranes too but what would they do? I understand lift things but lifting one block wouldn't be much use. The stream will start around 10:30 EST Saturday February, 7th 2015th. And the dev stream is live come join the stream to see whats new with the mod!! The big ones could be able to pick up bigger chunks of blocks and move them, while the smaller ones could put them all together to build something. Also another Idea you could add is a wrecking ball, maybe to take down mountains quickly. I've been watching the stream and I have an idea for the wrecking ball. If possible you could give it a maximum extension range and make it slower so it isn't as OP. Thanks for stopping by the stream it was fun & I'll probably stream again today. Regarding the wrecking ball: That would help it not be as OP but in order for it to "feel" right it needs to have momentum and physics calculations added to it that will break the appropriate amount of blocks based on its speed & mass. For now I have several other things to add to the mod that are more critical to it being a finished mod that I'll work on first :D.
Updated the main post with the latest changes. 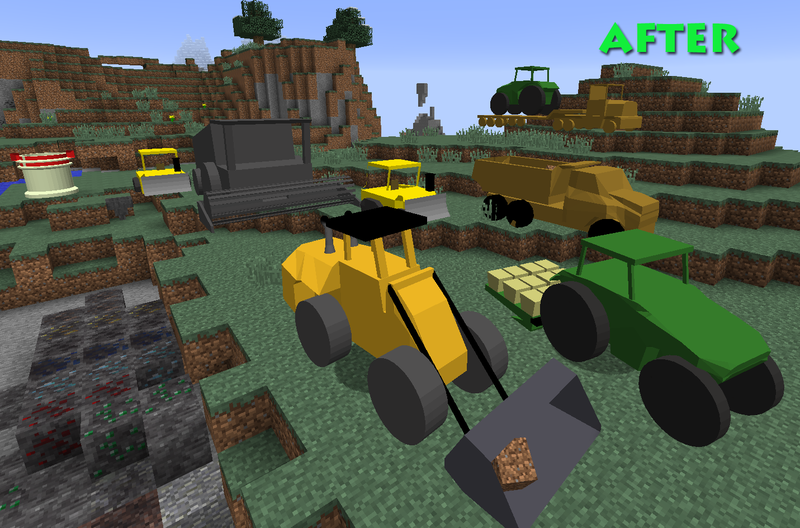 Working Combine, Wide Bed Truck, Excavator, added corn block, corn items, Crusher & conveyors added working and are directional. Lots of work on textures & 3d models. 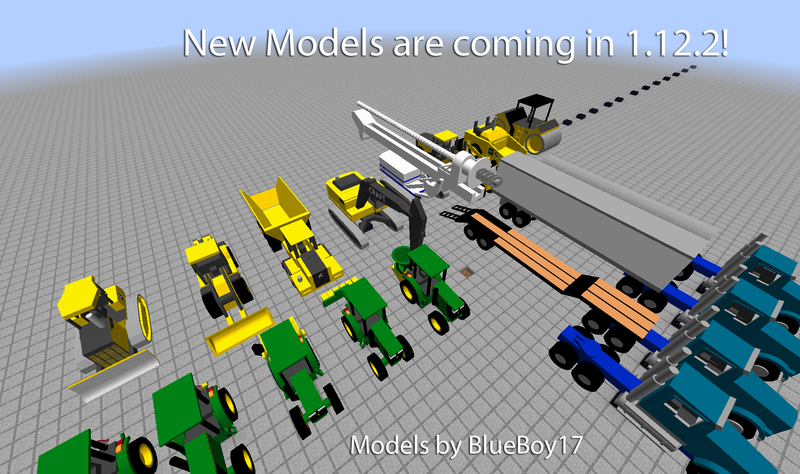 A few machines are still Wip and not shown in the screenshots because the 3d models are not ready yet. Wasn't able to catch that stream because of school, just wondering if you slowed down the conveyors and made it possible for them to move players. Yes, the conveyors are all fixed up now. They move players mobs and items are directional based on the way you place them and have an animated texture. I'm not a texture artists so it definitely could use a real artist touch on textures. I just need someone that is good at it. Not saying they need to fit the look 100% .. these are things that are not part of the minecraft world after all.